One of the drawbacks of solar energy systems is that the Sun doesn't provide a constant stream of energy. On cloudy days or at night, the amount of energy your system receives is reduced or eliminated altogether. This in turn impacts the amount of electricity or heat that your system produces during those times. To overcome this drawback, homeowners can take advantage of several methods available to them for storing solar energy. The methods available differ depending on whether you are using solar electricity applications or solar heating applications. One way solar power storage can be accomplished is by using a battery bank to store the electricity generated by the PV solar power system. A battery solar power storage system is used in a grid-tied PV system with battery backup and stand-alone PV systems. Charge Controller: Prevents the battery bank from overcharging by interrupting the flow of electricity from the PV panels when the battery bank is full. Battery Bank: A group of batteries wired together. The batteries are similar to car batteries, but designed specifically to endure the type of charging and discharging they'll need to handle in a solar power system. System Meter: Measures and displays your solar PV systems performance and status. Main DC Disconnect: A DC rated breaker between the batteries and the inverter. Allows the inverter to be quickly disconnected from the battery bank for service. 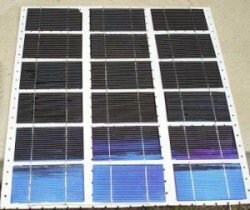 The third type of PV solar power system is a grid-tied PV system. This system can actually use the grid as its solar energy storage system. This is done using net-metering. With net-metering, when you produce excess solar electricity, you send it to the grid and your electric meter rolls backwards. Later on, at night for example, when your system is not producing electricity, you can pull electricity from the grid and your electric meter will roll forward. You are essentially using the grid to store your solar electricity! Each of these solar heating applications uses their own methods for Solar Thermal Energy Storage. Thermal mass and water tanks are the two primary methods of storing solar energy in solar space heating systems. Thermal Mass: Used in both passive and active space heating systems. Absorbs heat during the day and slowly releases it at night. Water Tanks: Used in active liquid systems. A heat-exchanger transfers the heat from the heat-transfer fluid to the water in the tank. Solar water heating systems use water tanks for the storage of solar energy. Both passive and active solar water heating use water tanks. Active indirect systems use a heat-exchanger to transfer the heat from the heat-transfer fluid. The other solar water heating systems use the actual household water and therefore do not need a water tank with a heat-exchanger. Solar pool heating uses the swimming pool water for solar energy storage. By circulating your swimming pool water through solar pool collectors, you will be able to extend your swimming season. 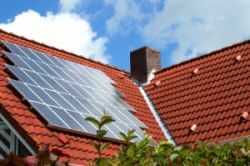 So, how is solar energy stored in residential solar energy systems? For solar electricity, it is stored using either batteries or the grid. For solar heating, it is stored using thermal mass, water tanks, or swimming pool water.